a spectacular viewpoint overlooking the lagoon and surrounding beaches. The five ablution blocks are kept spotlessly clean and features showers and baths, scullery and a well-equipped laundry with washing machines, tumble-driers, irons and ironing boards. The playground features jungle gym, slide and swings, and here is where all the kids meet and get to know one another. Entertainment programmes, table tennis, T.V. with M-Net, and videos during the summer holiday season all adds to the enjoyment for a wonderful holiday. Enjoy the independence and freedom of a caravan or camping holiday in an area of unspoilt beauty and Golden beaches.All our sites have electrical outlets and water points nearby, and most offer full or partial shade. 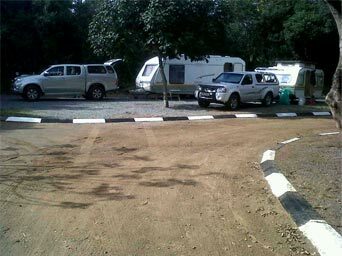 The sites are level and are large enough to accommodate most caravans, motorhomes and tents. 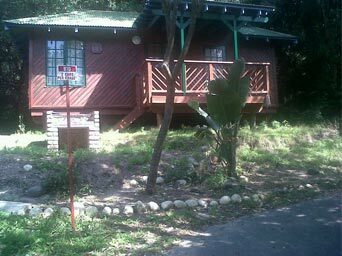 At Gonubie Holiday Resort we also offer you comfortable self-catering accommodation: - one cottage as well as 20 Timber chalets that are all fully equipped for a family holiday. All the units have bed linen, blankets and towels provided. Gonubie Holiday Resort has received 3 Stars from the Tourism Grading Council of South Africa for their Self Catering facilities for 2005. To unwind in the evening, after an action packed day, you can walk to our local Pubs and Restaurants and even join in the sing-a-longs that the locals are always prone to get going!